What to expect, when? 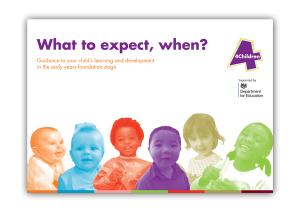 is a simple guide which takes parents through the expectations of each age band in the EYFS and how they can support their children’s learning and development. Click on the image to read or download the booklet. The Early Years Foundation Stage (EYFS) sets the standards that all early years providers must meet to ensure that children learn and develop well and are kept healthy and safe. It promotes teaching and learning to ensure children’s ‘school readiness’ and gives children the broad range of knowledge and skills that provide the right foundation for good future progress through school life. To work closely with Huntingdon Primary Foundation stage staff to make effective transitions for children (and parents) of all tracked learner groups thereby promoting continuity of learning and child initiated play. To continue to develop assessment and record keeping so that it accurately reflects all our children’s achievement. To support the parents of children from Eastern European families through the education system and on into school so that these children reach their potential. This is a very brief explanation of our focus but if you would like to know more then please come and ask the staff. The assessment requirements (when and how practitioners must assess children’s achievement, and when and how they should discuss children’s progress with you). Below is a brief explanation about each of the areas of learning and development. Please ask your child’s Key Worker if you would like more information. Personal, social and emotional development involves helping young children to develop a positive sense of themselves and others; to form positive relationships and develop respect for others; to develop social skills and learn how to manage their feelings; to understand appropriate behaviour in groups; to have confidence in their own abilities. Literacy development involves encouraging children to link sounds and letters to begin to read and write. Children must be given access to a wide range of reading materials (books, poems and other written materials) to ignite their interest. The name of the phonics programme we use is: ‘Sounds and Letters’ Principles and practice of Phonics Phase One teaching programme. Published by the DFS. Reference: 00113-2008PCK-EN. Mathematics involves providing children with opportunities to develop and improve their skills in counting, understanding and using numbers, calculating simple addition and subtraction problems; and to describe shapes, spaces and measure. Understanding of the World involves guiding children to make sense of their physical world and the community through opportunities to explore, observe and find out about people, places, technology and the environment. Expressive Arts and Design involves enabling children to explore and play with a wide range of media and materials, as well as providing opportunities and encouragement for sharing their thoughts, ideas and feelings, through a variety of activities in art, music, movement, dance, role-play, and design and technology. In order to tune-in to each individual child’s learning and development, the Nursery operates a Key Worker system. Once your child has settled in and is separating from you confidently we will allocate them a named adult – a key person. Their role is to liaise with you frequently, to observe and monitor your child’s learning and development, and to give you updates and information, especially if there are changes to the normal routine. It helps us to know how things are at home and if your child is worried about anything so that we can make sure they are checked and supported in Nursery. At least once every half term your child’s key worker will arrange a convenient time to meet with you to discuss your child’s progress. You will be able to ask questions, share information and agree next steps for your child with your key worker.